Treadmills are the most popular home fitness machines, according to “Consumer Reports.” With a treadmill set up in your home, you can perform an efficient cardio workout, whether you’re into walking, jogging or running. 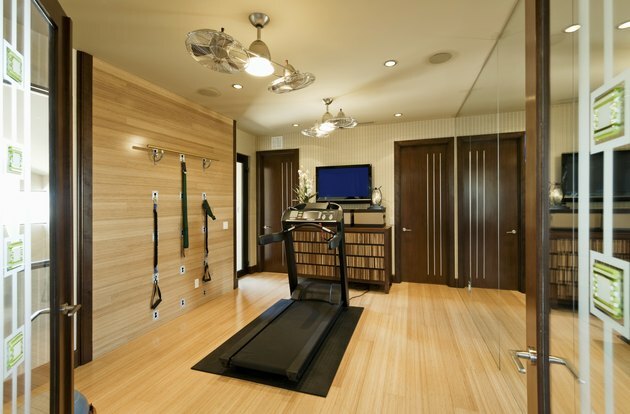 But treadmills take up about 20 square feet on your floor, which may be too much space to lose in a small home. In this case, a compact treadmill may be the only device that fits both your home and your fitness needs. The most compact form of treadmill is a machine you can fold up and store. Indeed, the thinnest folding treadmills can fit under many beds when they’re not in use. A standard treadmill is about 6 1/2 feet long and 3 feet wide, says “Consumer Reports,” or roughly the size of a couch. Folding treadmills are about half as long when you fold them up for storage. If you store a folding treadmill by leaning it against a wall, you might not care how thick it is. But that’s not the case if you want to store it in a more limited area. Some folding treadmills are more than 2 feet thick when you fold them, making it unlikely that they’ll fit under your bed, for example. The most compact treadmills, however, are only 10 to 11 inches thick. A compact treadmill won’t be very useful if you can’t fold it or move it in and out of position easily. If possible, therefore, test a folding treadmill -- or a demonstration model -- before you buy. First, see how easy it is to fold, and whether it stays together securely. Next, move the treadmill on its wheels to make sure you can transport it from the machine’s storage area to your workout space. The running surface of a folding treadmill is typically not as long as a non-folding version, which shouldn’t be a problem if you’re a walker or possibly even a jogger. If you prefer to run, however, the deck may be too short. Again, try the machine out if possible, or measure your running stride and see if the compact treadmill’s deck is sufficiently long. A typical folding treadmill also contains a less-powerful motor than a standard machine, which can limit the smaller treadmill’s speed, although typical compact models have maximum speeds of 10 mph. A smaller treadmill may also have a lower weight limit. As with standard treadmills, you’ll find a variety of options among folding treadmills, depending on their prices. The more expensive models are likely to be sturdier and to have more high-tech features, such as a heart rate monitor or programmed workouts. Even if your compact treadmill is only long enough for walking, you can still enjoy a good workout. For example, walking at 4.5 mph -- a 13-minute-mile pace -- burns about 300 calories per hour if you weigh 125 pounds, 372 calories if you weigh 155 or 444 calories if you weigh 185. You can also make the workout more intense by raising the treadmill’s incline. Compact treadmills typically incline as much as 10 percent.